Mimmo Cozzolino, migrant: arrived Australia 1961. The Australia Project started well before I arrived in Australia from Italy, aged 12. My Dad, a printer with a secure job in Naples, wanted to provide the best for the future of his three sons. He knew that opportunities were limited in Italy. Migration seemed a good way out. He tried Argentina and was knocked back. He tried Australia and was also knocked back. But that didn’t dampen his enthusiasm. One of his best friends, also a printer, had successfully migrated to Australia with his large family. The letters he was sending back to Naples gave glowing reports of life in the faraway island continent of Oceania. The family, especially the kids, had plenty to eat. Milk and meat were cheap and plentiful compared to Naples. Melbourne, it seemed, was easy going. If you worked hard you prospered and you could even buy your own house. There was political freedom and lots of opportunities. Best of all there was tons more space than back in the old country. He urged my father to apply again to migrate to Australia. While he waited to hear news of his application Dad did a bit more research on his ‘promised land’. Australia, he told us one night, was a big country. In fact, 25 times bigger than Italy. There were lots of deserts. The seasons were all back to front and there was no snow at Christmas! He told us about the native Australians and their magical boomerangs, and the trees with the flat leaves which grew pointing down. He mentioned the unusual animals: the ‘canguro’, the koala, the laughing bird. I was totally enthralled by his stories and excited at the prospect of actually going to this amazing place where it would take us 30 days on a ship to arrive. I couldn’t wait. Eventually our migration papers came through and within months we were on MV Flaminia bound for Australia. Within a few days of arriving in Melbourne in August 1961, Dad found a job as a printer. He then found cheap, shared accommodation in Kensington, an industrial, decaying, Melbourne inner suburb. Our house was directly opposite a tannery and not far from the Flemington stock yards. Living in shared accommodation came at a huge sacrifice. Within four years, and mainly on one wage, my parents had scraped enough together to put a deposit on a house of their own in West Heidelberg. It would have taken a lifetime of sacrifices to achieve the same thing back in Naples. At the new place the back yard was magically transformed from a clay pan to a bountiful garden providing fresh vegetable and flowers for family, friends and neighbours. I helped to dig the beds. Mum kept chooks for fresh eggs and manure. Dad spent every spare minute in the garden once he came home from work and before it got dark. My parents found it hard to learn English, especially Mum. They socialized mainly with the Italians they had met on the ship coming over. But they fell in love with the natural beauty of Australia– the flora and fauna, the coastline, the forests. With their Italian friends and through the Catholic Church, there were a lot of bus trips to the countryside and seaside. The things that Mum and Dad always raved about when returning from these trips was the space, the sense of freedom, the peace and quiet and the fresh smells of the bush or the ocean. As soon as they could afford it, they bought a second hand car so we could go on trips of our own. Mum was besotted with native trees and native flowers and the fragrance of a eucalyptus forest would bring her back to life when she was depressed. On summer evenings Dad would often drive her to Whittlesea or Kinglake for a ‘breath of fresh air’. My parents decided very early on that Australia was going to be their new country. They both became Australian citizens soon after settling here. They never stopped singing Australia’s praises. I remember some of their Italian friends complaining about some things in Australia and how they were better in Italy. Dad would just say ‘Well what are you waiting for? Why don’t you go back to Italy to live’. Mum and Dad went back to Italy to visit twice. In 1983 I went to Italy for work for two months and took my mother with me. She was going to stay with the relatives while I was working. She couldn’t wait to get back to Melbourne. She said Naples was chaotic, filthy, noisy, polluted and corrupt. And that Australia was ‘civilized’ compared to Italy. ‘They don’t even stop at red lights.’ She loved the law and order of Australian society. ‘Compared to Italy’, she used to say, ‘Australia is Paradise’. My parents died about five years ago, within six months of each other. Years before she died Mum told the family that when the time came she wanted to be ‘barbaqued’ and asked us that her ashes be spread in two of her favourite places: the Grampians (she couldn’t pronounce Gariwerd) and the forest at the back of Lorne. My parents’ story is not that remarkable on the Richter scale of life, but it is the unsung story of hundreds of thousands of migrants that find a place under the Australian sun. It is a story of vision, courage, deprivation, sacrifices and gratitude. Michele and Chiara’s love of Australia as their adopted country is a story that has been a wonderful inspiration to me and my work. They probably would not have felt comfortable calling themselves Australians. Equally they may not have been comfortable calling themselves Italians any more. My brother must have sensed this intuitively when he visited Naples recently. He took a small box of Mum’s ashes and spread it on top of Mt Vesuvius. Just to be on the safe side. 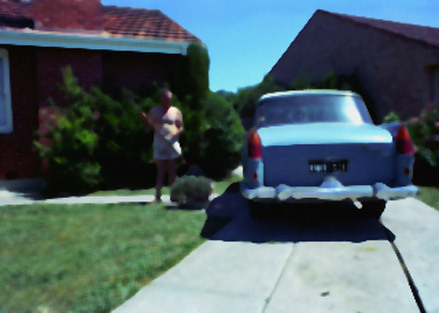 Arcadia 1 and 2 belong to the series Arcadia del Sud: West Heidelberg, Melbourne Australia, circa 1966, 2003. The series won the Leica/CCP Documentary Photography Award in 2003. 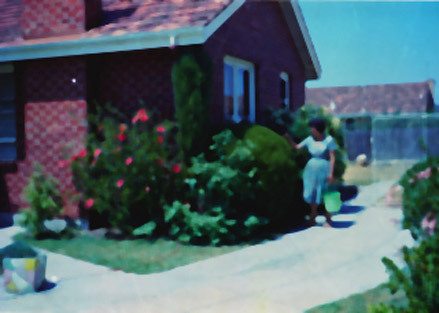 ‘Arcadia del Sud’ is a digital reworking of a series of snap shots I took in the mid to late 1960s, which I particularly like because they show my parents literally basking in their new-found economic freedom as ‘New Australians’ in the land I have called Arcadia del Sud– Arcadia of the South. These images show my Mum and Dad in their recently purchased brick veneer home in the Victorian Housing Commission estate of West Heidelberg. They are proud of their garden, chooks and of the ‘new’ second-hand Austin Freeway in the drive. All this they achieved a mere four years after arriving in Australia in 1961. Mimmo came to Australia at the age of 12 in 1961. Originally trained as a graphic designer, more recently he obtained a Bachelor of Fine Art from Monash University where he is now completing an MFA. In 2003 he was the winner of the Leica/CCP Documentary Photography Award. In 2008 he was visiting professor at Sungshin Womens’ University, Seoul, Korea. He was co-author of Symbols of Australia (Penguin, 1980) a visual history of Australian trademarks. With All Australian Graffiti he co-authored the best selling The Kevin Pappas Tear-Out Postcard Book (Penguin, 1977). In 1987 a handful of Melbourne designers, including Mimmo, founded AGDA.